In front of the piece of coast which unites Trapani with Marsala, in the Western part of Sicily, there are a group of islands which form part of the Stagnone: a coastal lagoon where one can visit the remains of the Phoenician city of Mozia, founded in the 8th Century BC, for commercial control on the Western coast. 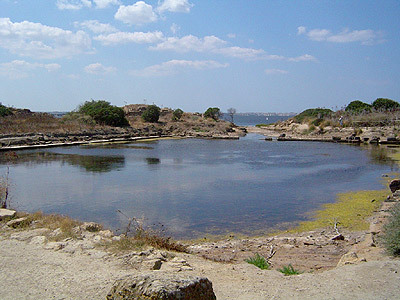 The lagoon is a natural regional reservoir and can only be visited by boat, by which one can also reach the other two islands: La Scuola and the Santa Maria. From the Phoenician-Roman period, the coast experienced a lowering, which caused a submersion of its ancient road which once joined it to the coast. The Phoenician City was conquered and destroyed by Dionysius II of Syracuse in 397 BC, but was immediately re-conquered by the Phoenicians the following year. The inhabitants escaped and founded Lilibeo, today’s Marsala, and Mozia slowly lost its importance. In 241 BC, the Battle of the Egadi Islands and the defeat of the Carthaginians, ended the First Punic War and sanctioned the handover of Sicily to the Romans. Mozia was practically forgotten until the end of the Norman era, when the island was given to the Basiliani (Basilican) Monks from Palermo, who gave it the name of San Pantaleo. Its modern history began in the 18th Century with the first identification of the island with ancient Mozia and the first digs during the 19th Century. But it was the archaeologist, Joseph Whitaker who, after having bought the whole island, undertook and organised the digs, bringing to light the archaeological jewellery of Mozia: the Case dei Mosaici (House of Mosaics) and that of Amphora, the Phoenician-Punic Sanctuary with its open ceiling known as Tofet and that of Cappiddazzu, the Porta Nord (North Port) area, from which the artificial road linking to the mainland began. Mozia was a fortified city with walls interrupted by quadrangular towers (5th Century BC), which can still be seen today along some parts.